Between the late tenth century and the late twelfth century, the musical notation known as neumes was provided in dozens of manuscripts for, among other texts, a number of Horace’s Odes as well as for sections of epics by Lucan, Statius, and Vergil. 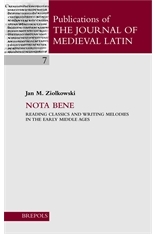 These materials constitute a paradoxical corpus of “classical poems in plainchant” that complicates our views of both how students learned Latin and what was being sung in an era most often associated with Gregorian chant. The book wrestles first with the literary-historical puzzle of why certain passages and not others were “neumed” and later with the ethnomusicological riddles of how, where, when, and by whom the passages were sung. See CONTACT for the editors of the subsidia series. Copyright © 2019 The Journal of Medieval Latin. All Rights Reserved.